Buy Granite Tile and Installation for your Oregon City Granite Tile Counter Project from Portland Flooring & Carpet in Home of Oregon City. Granite countertops are riding a wave of popularity that certainly isn’t just a trend. Granite tiles, being a natural stone, display a timeless beauty that has been admired for centuries. Granite Tile Countertops are and will continue to be a valued countertop material for years to come. In Oregon City Granite Tiles are available at discount prices from Portland Flooring & Carpet of Oregon City, Portland’s discount tile outlet. Call (503)451-5353 or fill out our online form to schedule a free estimate with one of our design consultants. The rich hues and textures of the stone add luxurious appeal to any kitchen or bathroom. Oregon City Granite tiles come in a wide range of colors. Visit our online store to view the many available colors. Granite Tiles are extremely scratch resistant and can be used to cut on. While most Oregon City homeowners will want to use a cutting board to keep their knives sharper, granite tiles can be cut with normal knives without concern of damage. Oregon City homeowners will find that they can place not pots and pans directly on their granite tile countertops without any problems. Granite was formed at very high temperatures below the Earth’s surface. Go ahead and place that hot pan on the counter while you’re cooking. It’s no problem! If you’ve got good experience laying tile, you may be able to install granite tile. However, without experience, it’s not hard to ruin the job. Potential problems include laying the tiles crooked and not getting the grout just right. If you have any concerns, it makes sense to have granite tile counters installed by a professional contractor. 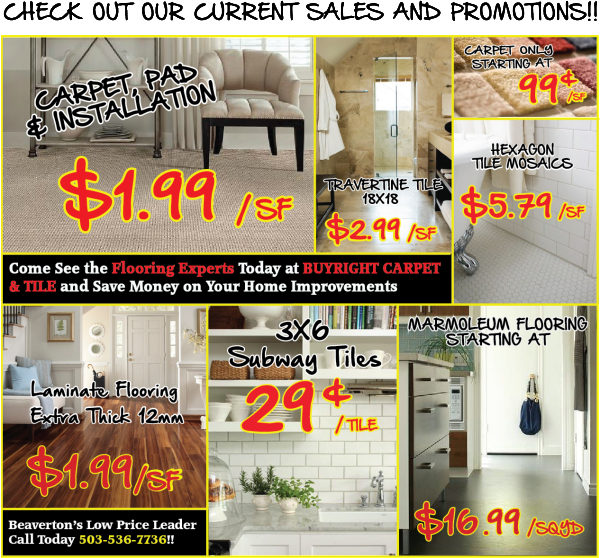 Rely on the professional guaranteed installation services of Portland Flooring & Carpet of Oregon City. We offer labor and materials specials on granite tile countertops at just $1499.00 which includes the granite tiles and basic installation. For a complimentary in home design consultation with one of our estimators, please call us today at (503)451-5353 or complete our online form.